Environmental crimes can undermine efforts in development assistance and sometimes threaten national security. 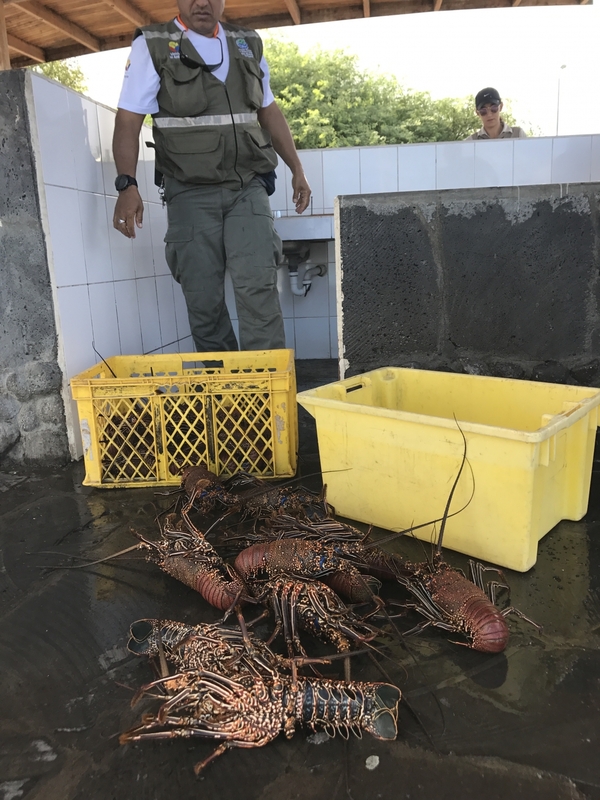 Programs and policies continue to be developed in response to risks posed by environmental crimes. Multiple sectors have called for an interdisciplinary risk management response that strengthens and synchronizes actions targeting coherent policy and behavior change interventions. 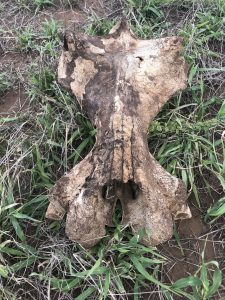 One strategy to address global risks, conservation, and criminology is to develop a better scientific understanding of the causes and consequences of human behavior that underlie environmental crime activities. Conservation Criminology is one such strategy. An interdisciplinary science incorporating criminology and crime science, risk and decision making and natural resource conservation and management. 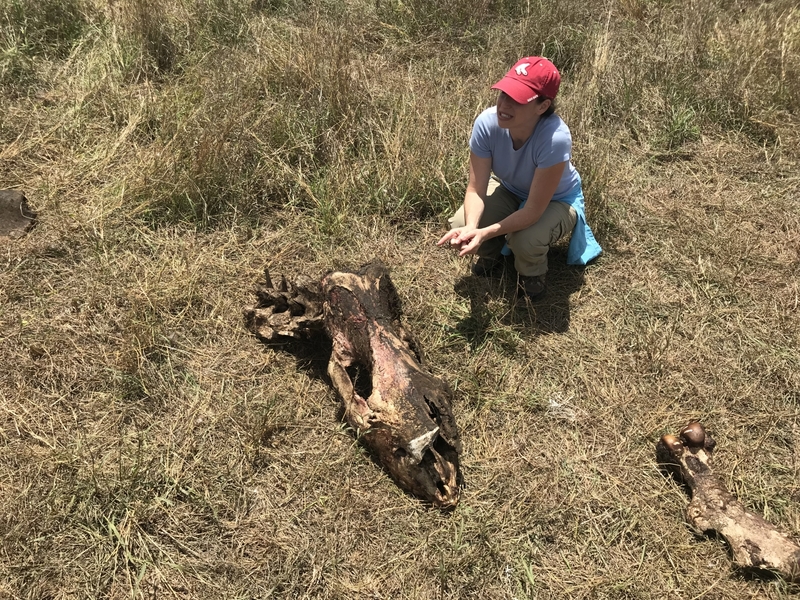 Meredith with an approximately 2 week old poached rhino carcass being investigated by law enforcement and forensic authorities. 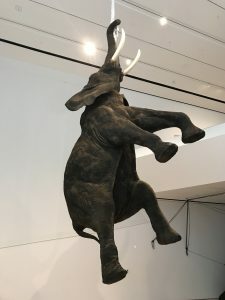 The Suspended Disbelief art exhibit at the MSU Broad Art Museum literally featured the elephant in the room–conservation crimes are now mainstream and widely known. By many measures, the environment faces threats from humans. Water pollution, climate change, deforestation, biodiversity loss, and invasive species all pose serious risks to the environment and are influenced in some way by people. Humans also face risk from the environment and its protection. Natural disasters such as wild fire, drought, floods and earthquakes threaten lives and livelihoods. Sometimes these risks are concentrated in a geographic area and disproportionately effect already vulnerable groups of people. 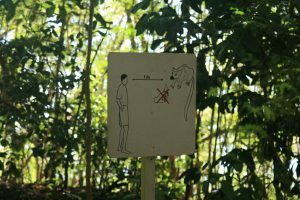 Environmental protection and conservation activities such as national parks or protected areas can exclude humans from the natural resources they depend on for well-being, cultural tradition, recreation, or subsistence. “Green criminology,” “environmental criminology,” and “conservation criminology” are three scientific terms to describe the growing body of scholarship about these issues. The debate about terminology is interesting to some scholars and leads to lively debate among some academicians. Conservation criminology offers a distinct way of thinking about human behavior beyond the traditional calculus of why people engage in crime or become criminally inclined. 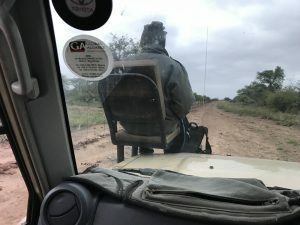 Conservation criminology considers why some people do not think that exploitation of natural resources is criminal. Conservation criminology engages the knowledge base from multiple disciplines to consider, for example, communities as powerful and positive agents of change, the risks that communities bear when living with wildlife, the ecological importance of wildlife in maintaining healthy ecosystems, the contribution of wild meat to food security and human nutrition, and the connection between killing and eating wildlife with increased risk exposure of contracting infectious diseases that animals transmit. 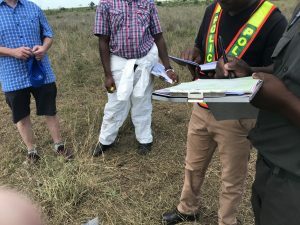 Beyond creating a space for building theoretical understanding about the nature of the problem and characterizing the on-the-ground context, conservation criminology offers a broad and evolving suite of tools for resilience. Understanding how conservation crimes occur so as to enhance efforts to reduce crime risks. 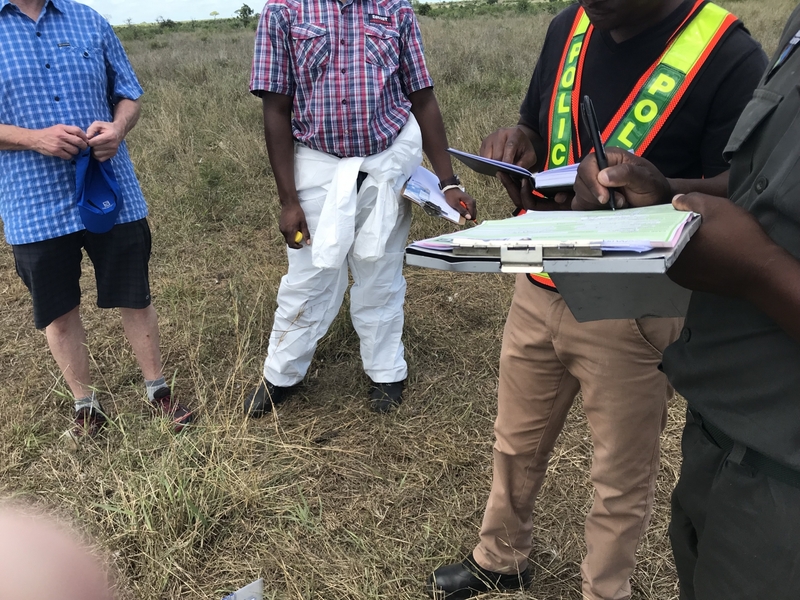 The conservation community is actively developing new policies and programs to help reduce risks to people, plants and animals and the environment from environmental crimes. Other times, illegal behavior is defined as being more opportunistic. 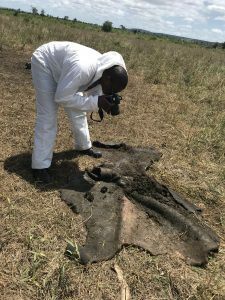 In many ways the conservation and environmental crime field does not hold these local people culpable for the high level, organized, sophisticated, transnational poaching and wildlife trafficking that occurs. Crime science offers a scientific way to NOT hold local people directly culpable via a suite of practical tools and techniques. Crime science is a crime centric approach with a primary mission of crime control and prevention and policy-relevant analysis; it emerged as a complement to criminology yet sought to overcome shortcomings. If the criminological mission is concerned with explaining why, the mission of crime science is concerned with discovering how. A stuffed sea turtle for sale at a local market in Africa targeting tourists and other affluent locals. Although it is useful to know why people poach and traffic wildlife, understanding HOW is essential for preventing crime from occurring in the first place. How do we reduce risky human behavior? Regular law enforcement patrols are one technique used to deter criminals from engaging in conservation crimes. Many protected areas are large and remote. Some private game reserves are able to fly expensive helicopters in support of anti-poaching patrols. Theories of lawbreaking that come from criminology may be used to understand global risks, conservation and criminology. Many of these ideas have been developed to address a wide range of crimes, not just those associated with the environment. The major premise of Deterrence Theory is compliance with the law. The focus of this premise is that certainty, severity, and swiftness of the application of sanctions will gain legal compliance with conservation/environmental laws. Deterrence theory offers one perspective on lawbreaking compared to, for example, Strain Theory, Social Learning Theory or Social Bonding. An overwhelming number of conservation crime-related interventions are based upon Deterrence Theory. Is this a good thing or a bad thing? Not sure, but at a minimum, one observation is that there may be a lot of other ways of thinking about the problem (and thus solution). There are two forms of deterrence theory. Classical deterrence holds that rational actors will perform behaviors they perceive as pleasurable and shy away from behaviors they perceive as painful. The threat of punishment is thought to be certain, severe, and swift and criminal behavior will be detected and punished. Yu and Liska (1993) and others have demonstrated that classical deterrence theory has problems explaining all criminal behavior. Contemporary theory offer additional measures including moral emotions (e.g., shame, guilt, embarrassment), social disapproval, and motivation. There are two forms of deterrence: specific deterrence (e.g., aimed at the known offender) and general deterrence (e.g., aimed at the general population). Both carry with them a set of assumptions. The success of deterrence-based punishment approaches have been called into question; in addition to empirical doubts over efficacy, there are moral considerations. For example, individual deterrence can be used to justify punishing the innocent as what matters is the communication of the penalty, allows for punishment in excess of that deserved by the offense, and be primarily concerned with offenses that might be committed in the future than with the offenses that have actually been committed. Petrossian, G. A. (2015). Preventing illegal, unreported, and unregulated fishing: a situational approach. Biological Conservation, 189, 39-48. Moreto, W. (2015). Introducing intelligence-led conservation: bridging crime and conservation science. Crime Science, 4, 15. How do we promote good governance and reduce risks associated with poor governance? Governance is highly relevant to the causes and consequences of risks, conservation, and crime. On a national scale, governance describes structures and processes for collective decision making involving government and nongovernmental actors. At the global level, governance embodies a horizontally organized structure of functional self-regulation encompassing state and nonstate actors bringing about collectively binding decisions without superior authority. Issues of declining state sovereignty and the consequent rise of competing forms of governance (e.g., private, inter-, transnational) represent a conceptual, normative, and political challenge for criminology. Critical criminology has historically viewed the state as being the primary problem whereas now one solution that some groups advocate for is a tightening of the state’s powers in order to reverse the effects of neo-liberalism and the spread of power to ungovernable and politically unaccountable spaces. Global governance has implications for criminology, conservation, and risk in their separate spaces; the issue is also relevant to the three when they are combined. In many instances, the word global is used to mean a homogeneous and uniform system, for example of mitigating risks of plastics in marine ecosystems, of crime control, or transboundary/ transfrontier protected areas. Today, scientists, conservationists, and criminal justice practitioners are organized in postnational ways, using the internet and email to communicate and share a common system of values, rewards, and events. Thus it is unsurprising that politicians from around the world borrow from the American style of communicating about crime. We talk about “zero poaching” or zero tolerance policing as examples of policy transfers. Some scholars remind us that we cannot and should not take for granted that surface similarities necessarily imply deeper convergence. Zero tolerance rhetoric may sound the same in the UK and the US, for example, but the policies mean very different things. When we start to think about global governance, we can think about reframing social justice and political action, which is often a desirable outcome. Fishers must check in with law enforcement authorities to ensure they are complying with all relevant rules. Transboundary conservation areas, such as the border of Mozambique and South Africa, carry with them unique governance challenges and opportunities. Peterson, M. N., von Essen, E., Hansen, H. P., and T. R. Peterson. (2017). 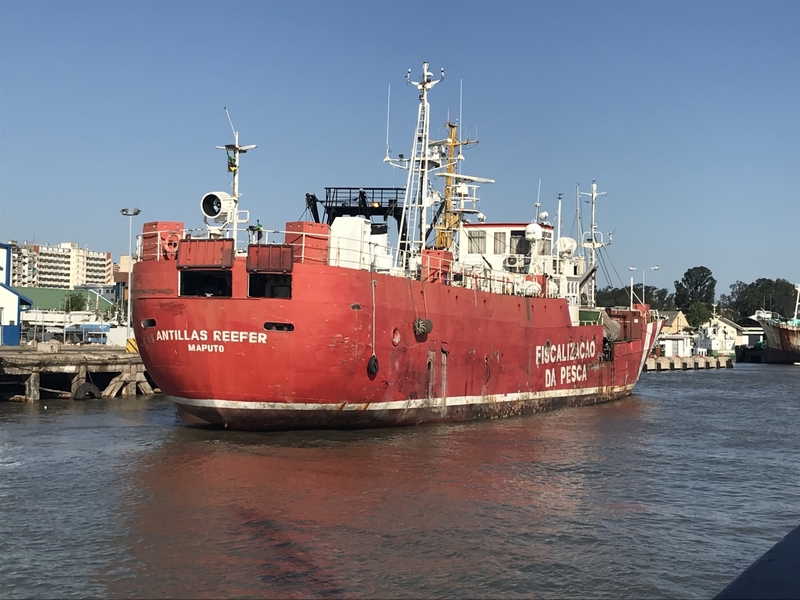 Illegal fishing and hunting as resistance to neoliberal colonialism. Crime, Law, and Social Change, 67,4,401-413. 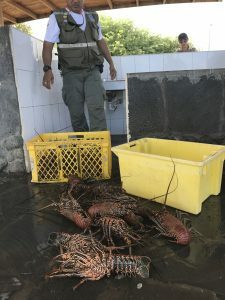 How do we leverage creativity to reduce conservation crimes and not create new opportunities for violations at the same time? 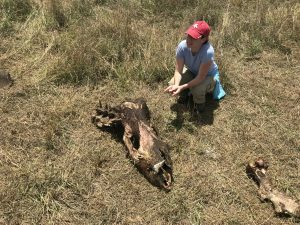 Forensic wildlife science has advanced law enforcement and criminal justice officials’ ability to detect and prosecute wildlife crimes. 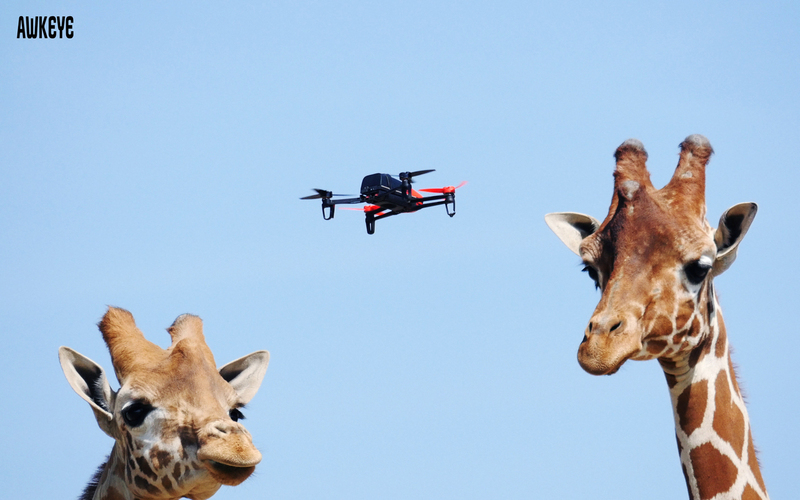 Conservation drones have received attention as their price has dropped and data collection capacity increased. 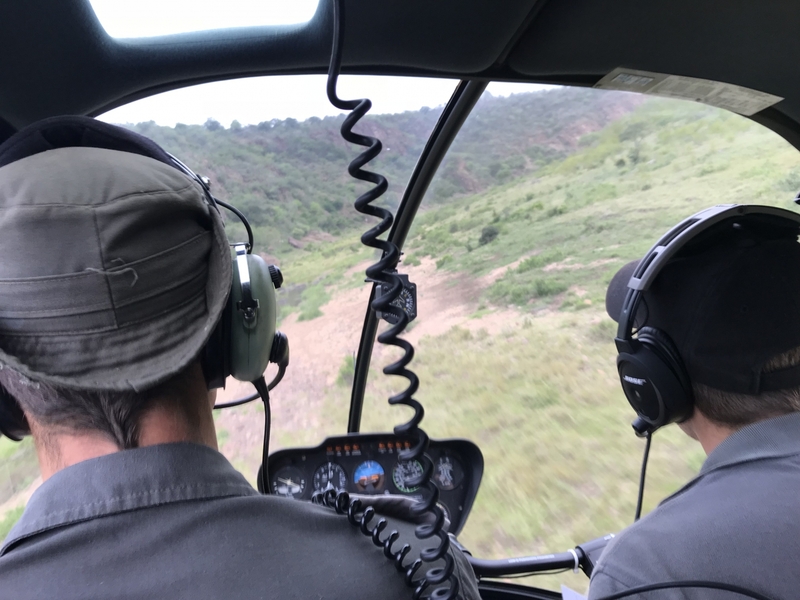 They are increasingly used to monitor wildlife and support anti-poaching efforts. Technology and innovation permeate many dimensions of conservation crime. Technology and innovation are both a cause and a consequence of conservation crimes. By cause and consequence, I mean that technology can proceed or result in environmental or other risks that pave the way for new crimes or impact the ability of deviant individuals, groups, and organization to behave in an environmentally threatening way. At the same time, technology is often developed in direct response to an environmental harm or risk that otherwise cannot be mitigated with existing technology. Implementing innovative technologies provides opportunities to counter conservation challenges at multiple levels and within every step of the crime process by providing those individuals, organizations, and governments working to dismantle illegal wildlife trade the tools and sophisticated structures necessary for a more holistic and integrated approach to address these problems. 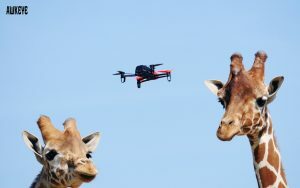 One of the potentially most significant benefits that modern technology can contribute to the fight against wildlife crime is the ability to coordinate huge amounts of data over space and time more efficiently. This benefit extends across many facets of the wildlife trade chain from patrolling for poaching activity in the field to customs clearance in consumer countries. Technology also poses challenges. Technological advances have enabled offenders to organize more complicated and successful covert operations. 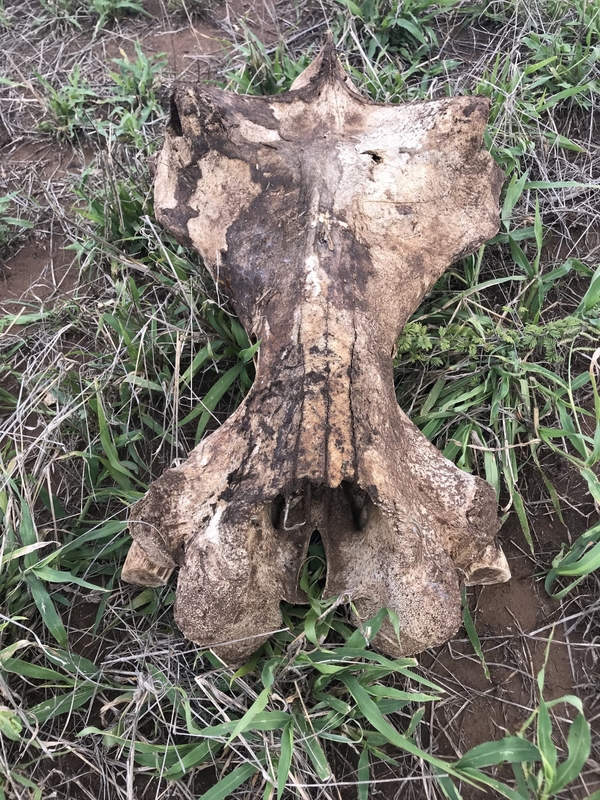 This has contributed to a dramatic rise in poaching and trade and has made situational crime prevention, market reduction approaches, and enforcement more challenging. Modern weapons and technologies for locating wildlife enable illegal killing to occur at much higher success rates than in the past. Modern criminals can more effectively disguise wildlife parts for consumption . In some cases, criminals employ sophisticated, encrypted online communications to plan illicit activities as well as coordinate and maintain networks. How do power and authority contribute to causes and consequences of conservation crime? Corruption and organized crime represent the underbelly of society, hidden from view, not always discussed and acknowledged and commonly attended to in a reactive manner. In conservation practice, corruption and organized crime are closely linked. Indeed, the US recognized this synergy in an Executive Order in February. This was noteworthy in that it identified wildlife trafficking as a major organized crime and linked organized crime with corruption. The nature, role, and extent to which organized crime and corruption factor into the conservation world is highly varied. It is possible to generate more questions than answers, especially when it comes to corruption reform. Social norms factor into play—either in providing inroads for corrupt behavior or the coercive practices wielded by organized crime syndicates. Perceptions of risk are an important component to think about here—the perceptions of costs and benefits of both corruption and reform and worry about retribution or retaliation or sanction all influence whether or not people engage in these illicit behaviors. Inherent to this conversation is what is legal/illegal and what is illicit. It is also interesting to think about the extent to which corruption and organized crime may be good for conservation in some contexts. Corruption at airports, seaports, and border crossings is known to enable wildlife trafficking around the world. Wyatt, T., Johnson, K., Hunter, L. et al. (2018). 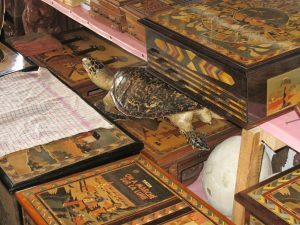 Corruption and wildlife trafficking. Asian Criminology, 13: 35. https://doi.org/10.1007/s11417-017-9255-8. Sundström, A. (2013). Corruption in the commons: Why bribery hampers enforcement of environmental regulations in South African fisheries. International Journal of the Commons, 7 (2): 454-472. Sundström, A. (2012). Corruption and regulatory compliance: Experimental findings from South African small-scale fisheries. Marine Policy, 36(6), 1255-1264. United Nations Office of Drugs and Crime. (2016). World Wildlife Crime Report. Global Financial Integrity. (2017). Transnational crime and the developing world. How, why, when, and where can guardians and guardianship be enhanced to reduce conservation crime risks? 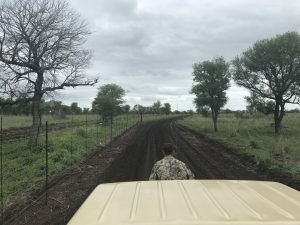 Anti-poaching patrols are increasingly militarized in some locations, mostly in response to the sophisticated and coordinated behavior of poachers. Enforcement is essential for protecting the environment. Without enforcement, the rule of law may not be implemented in full or correctly. 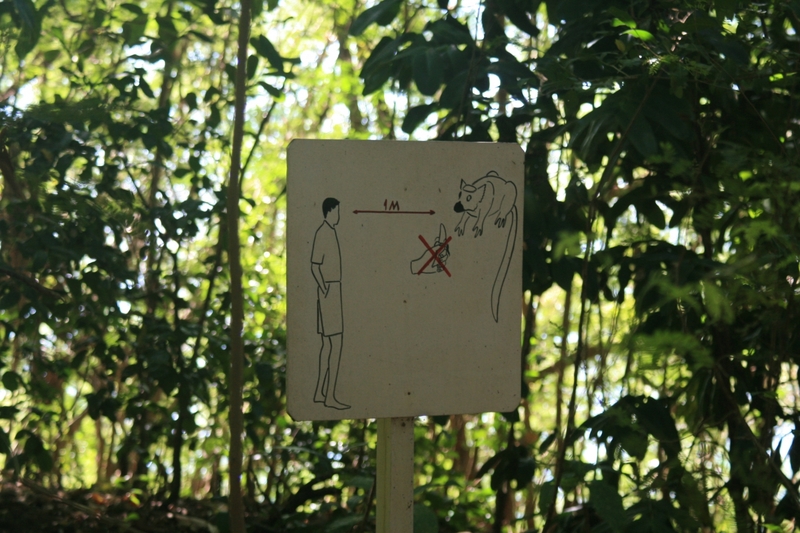 Given the importance of rules for effective conservation, it makes complete sense that we consider rule enforcement! There are multiple actors that can have responsibility for policing and enforcement in the conservation domain. We can focus on police, although in the environmental sphere there are are a lot of nontraditional guardians, if you will. Police and other law enforcement officers have and will continue to play a key role in successful conservation. 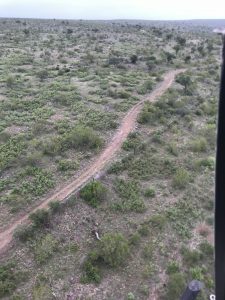 As an institution, police are often criticized for failing to fully or appropriately protect environmental resources such a national parks and the biodiversity within. Michael Pendleton offers a direct critique of how police and the enforcement community contribute to illegal logging in the United States. The idea and importance of community is a common theme in conservation. 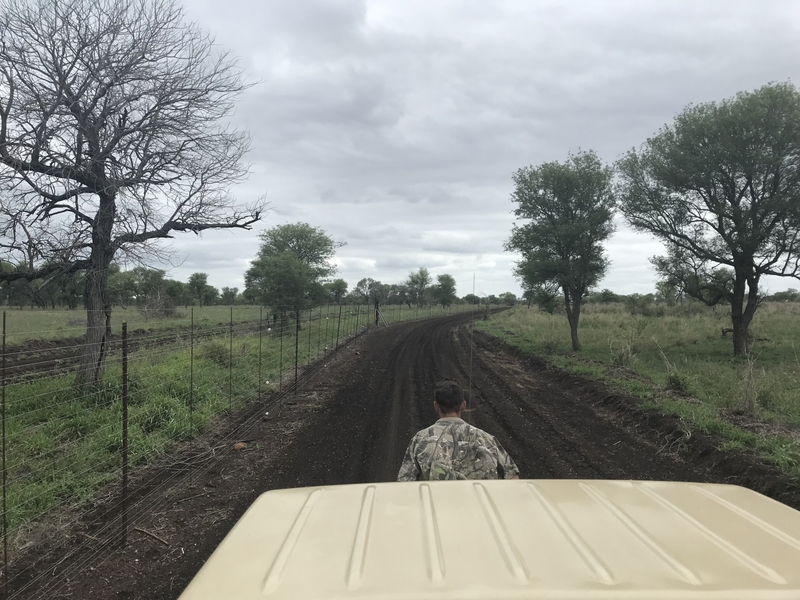 Community may refer to local-level groups who are embedded within the geographic region they patrol or international groups of actors such as law enforcement organizations that are working together on wildlife and timber crime deterrence. How can demand for illegal wildlife and their products be reduced? Economic dimensions are considered both a cause and a solution to a variety of conservation crime. Markets can be regulated, and as such may be legalized and illicit. As the world increasingly globalizes, market may play a larger role in conservation criminology—many argue that markets are the fundamental structure upon which globalization is built. Markets relate to demand and demand is one of the pillars of the US Strategy to Combat Wildlife Trafficking. Here are some examples of how demand has been incorporated into the problem set. The U.S. 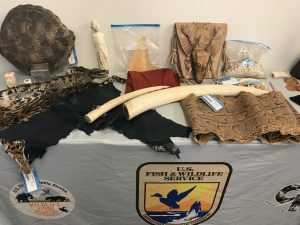 Fish & Wildlife Service completed its implementation of a near-total domestic ban on the trade in African elephant ivory. Building on that effort, diplomatic engagement with China led by the Department of State resulted in China’s announcement that it will complete the closure of its domestic market for elephant ivory by the end of 2017. U.S. Embassies continue to promote demand reduction activities overseas. A new Public Service Announcement by the U.S. Ambassador to China was seen by 780,000 people daily, building on a USAID campaign that is seen by more than 23 million people daily. Surveys on the impact of USAID’s far-reaching demand reduction campaigns in Asia found that 11 percent fewer Chinese consumers reported buying ivory since the previous year, and only seven percent of Vietnamese consumers said that they would purchase “medicinal” wildlife products again. Separately, a Demand Reduction Toolkit was completed and is being used to develop new behavior change campaigns. But beyond markets, consumer demand is a huge issue when it comes to driving environmental crimes. Check out this website to learn more about how, when, why, and where the issue arises. Many species are threatened by consumer demand for novelty pets. 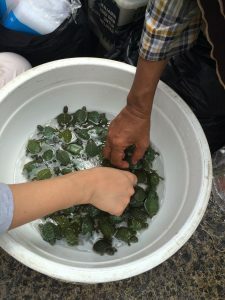 Illegal pet trade enables zoonotic disease transfer in addition to involving animal welfare issues. 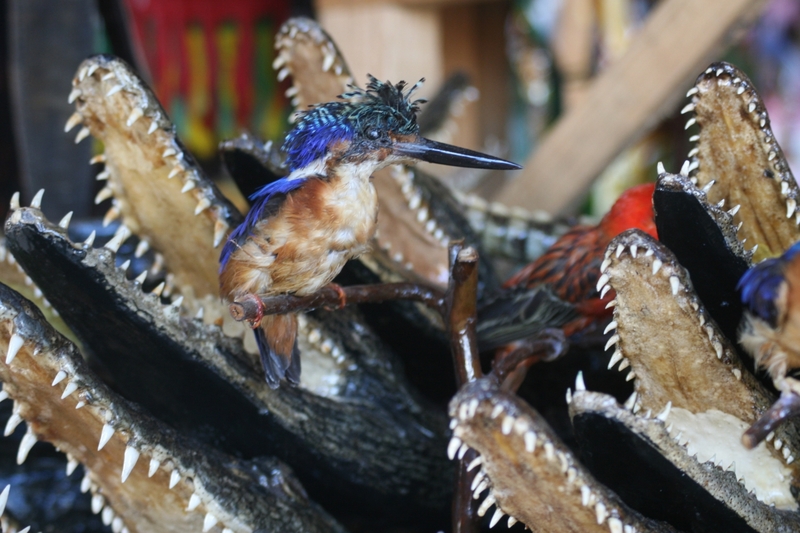 This stuffed and endangered Madagascar malachite kingfisher could be openly purchased by tourists in a local market. How do we promote, enable, and affirm following of rules and norms? 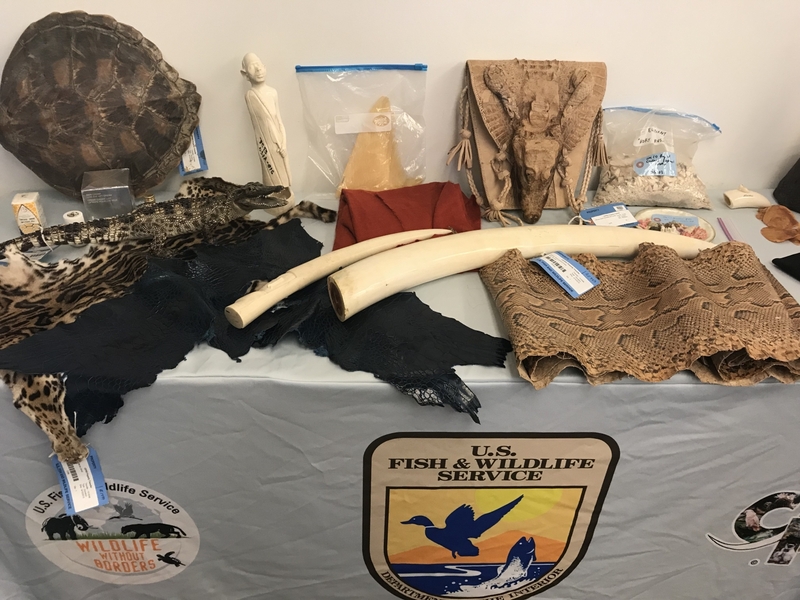 The US Fish & Wildlife Service confiscates a wide array of wildlife-related products from tourists who may or may not know they need to comply with wildlife trade laws. Awareness of rules is a requisite for compliance. Signage is one way to enable compliance. Compliance is a fundamental expectation for conservation. There are many different ways to example compliance with conservation rules. Most individuals comply with laws and regulations out of deference to authority or belief that behavior prohibited by law is morally wrong. In other words, most people comply because they believe it is the right thing to do. For others, violations result from unintentional acts due to lack of awareness or inability to comply with regulations. In other cases still, individuals are motivated to intentionally violate laws and regulations. Across Hurd’s (1999) framework there are four essential components of compliance: (1) compliance is more likely to occur when there is awareness and understanding of the regulation, (2) positive perception of the appropriateness of the behavioral restriction set by a rule (including agencies and agents related to the rule) reflect a high level of legitimacy and will lead into compliance, (3) A high level of pro-compliance coercion, or presence of threat, generally leads to compliance, as long as the punishment is greater than the possible personal gain, and (4) the more any given rule is congruent with an individual’s self-interest, the more likely it is that individual will comply with the rule. These four domains for assessing compliance: knowledge, self-interest, legitimacy and coercion, have internal and external considerations. External considerations refer to influences that an individual cannot control himself/herself, but that another individual could change and manipulate. Internal considerations are influences which occur and are processed within the individual, such as thoughts, perceptions and feelings towards something or someone, which another actor cannot directly manipulate. How do we DO conservation criminology? Interdisciplinary science carries with it a unique set of methodological challenges and opportunities. Similarly, conducting policy-relevant science is distinct from strictly theoretical inquiry or bench science. Conservation criminology, for better or worse, carries with it all of these attributes.What are the implications of this? First, the methods that are employed to frame, analyze, and interpret research questions and hypotheses carry with them a larger burden of proof, in my opinion. Can you justify the appropriateness of your decision to use a particular method to collect data? How do you justify using a particular theory to guide your approach for measuring variables and social phenomena the way you are? The issue of ethics in conservation criminology is multifaceted. I think principles from indigenous criminology really reflect some of the root principles for conservation criminology to attend to. Essentially IndCrim argues that the failure to address issues of representation of Indigenous people in conversation about crime control systems rests in part with the paternalistic tendencies of settler-colonizer governments and the Eurocentric bias of many within mainstream criminology. 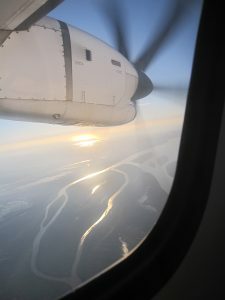 Dominant explanations of the causes of this problem, and policies and interventions designed to alleviate it, tend to pathologize Indigenous people, presenting them as individuals prone to criminality, and their cultural knowledge, philosophies, and social practices as deviant and criminogenic. IndCrim mostly refers to the analytical and epistemological approach to examining relationships between indigenous peoples, criminal justice systems, and the criminological academy. It is based on historical and contemporary conditions, holds that Indigenous knowledge is vital for the purpose of gathering, analyzing and disseminating findings, and aims to speak truth to power. 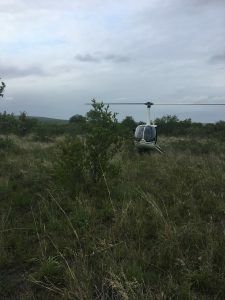 Collecting field-based data using a conservation criminology framework carries with it a distinct set of considerations for reliability and validity, as well as ethics. Participatory risk mapping is one data collection method with broad application in conservation criminology-based research. How, when, where, and why do conservation crimes overlap with other serious crimes? Conservation crimes can converge with other serious crimes. 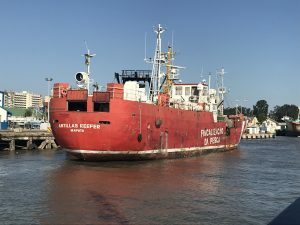 Perhaps the most widely known example is the connection between illegal fishing and human trafficking. In the context of conservation crimes, convergence refers to the integration of multiple networks that move illegal goods throughout the world. Convergence is rooted in the intersection of crime and deviance, typically with implications for policy making and on-the-ground practice. Convergence is one relevant way for thinking about resolving conservation crime risks at multiple scales. The idea has economic implications, given illicit markets often represent connected problems primarily driven by supply and demand. Key to convergence is the overarching phenomenon of globalization, which enables ready access across national borders, anonymity provided by information technology, and secrecy in international finance. Deviant globalization incorporates the underside of transnational integration, including cross-border economic networks that produce, move, and consume drugs, wildlife, counterfeit goods, toxic waste, and humans. These activities take place in the shadows of the licit global economy. Bad actors use the technical infrastructure of globalization to exploit gaps and differences in regulations, law enforcement, or markets for illicit goods and services. How do we achieve a state where risks are as low as reasonably possible? Criminologists are very focused on security and only recently have the conservationists begun to think about how the concept applies to natural resources. Like compliance and non-compliance, security is coupled with insecurity. Most of us are old enough to be aware of the contemporary emergence of security after 9/11. The idea has since been mobilized in a number of ways including: governing security, governing through security, selling security, imagining security and tackling insecurity. In classical terms, security means the integrity of territoriality organized sovereign nation states within the system of international law as represented by the United National since the end of World War II. New, broader concepts promote thinking about security policy beyond the military capacity of nation states but also the ability to use political and socioeconomic crises that threaten to cross the threshold to violence and to do so as early as possible using non-military and if necessary, military means. The concepts explicitly includes interests in securing strategic resources which serve to safeguard affluence in the industrialized nations. Political theory proposes three types of security: (1) security from threats such as enemies; (2) security, or access to, basic goods and rights; and (3) security of states of being, such as peace. The first type of security is most commonly diffused in our popular culture, but really, all three types are relevant to this course. Security is a concept that is closely aligned with concepts of power and power relations. It is interesting to think about how society chooses to respond to security, or rather, insecurity. Molotch (2012) called attention to the extend that risk and fear factor into responses to insecurity, particularly the security architectures and technologies. 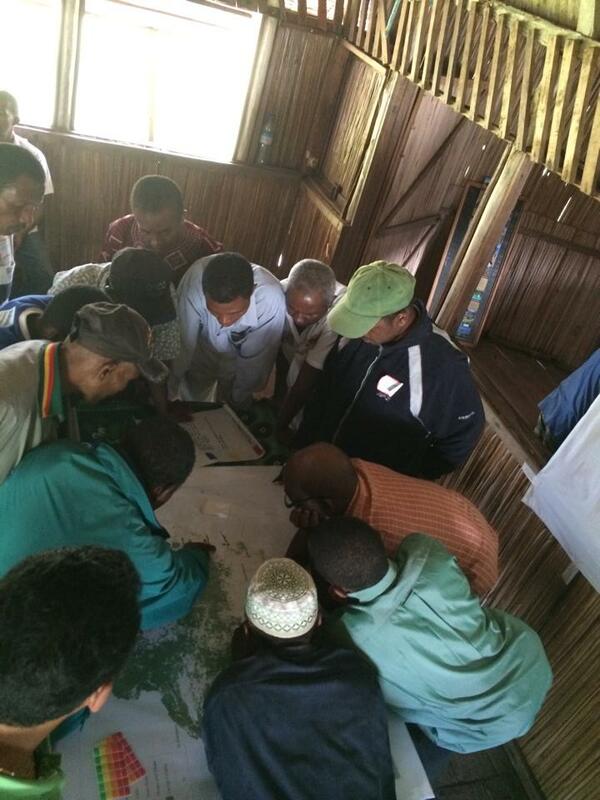 In many ways there tends to be a top-down command and control approach to security, which can be at odds with the highly decentralized forms of community-based natural resources management that prosper in regions with rich biodiversity and conservation challenges. Top-down approaches often involve surveillance and security management by authorities with little evidence that the strategy actually works. 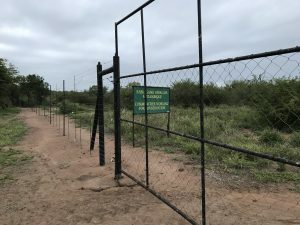 There are diverse strategies and tactics for enhancing security, such as building fences around protected areas that are designed to keep wildlife in and poachers out. In many instances, wildlife poaching and trafficking involves illegal border crossings and gun trafficking, and thus threats to sovereignty and security.